Happily you probably don’t need a $500+ unit for your portable communication needs (but it would sure be nice!). Please also see our article A Prepper’s Introduction to Walkie-Talkie Radios to provide some background and additional helpful information on this topic, and our article How to Maximize the Range of your FRS/GMRS Radio for further related information. This is the first of a two-part series on how to choose the most appropriate FRS/GMRS walkie-talkie for your requirements. Read about more features and considerations in our second part. This article assumes you are considering the purchase of one or more ‘walkie-talkie’ type radios – ie, handheld, battery-powered, portable transceivers with built-in antenna, microphone and speaker, and which operate on either FRS and/or GMRS frequencies. Many of these comments will also apply to CB or MURS type handheld transceivers too. 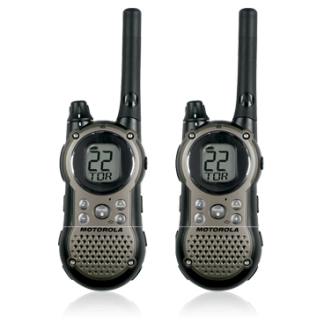 Portable transceivers – aka walkie talkies – are one of the three typical types of radios generally for sale. The next type of radio, increasing in size and decreasing in portability, is the mobile radio – units designed to be mounted in a vehicle, and operated with an external antenna and powered from the vehicle’s 12V power supply. A separate microphone is required, and sometimes these microphones have control functions built-in to the microphone housing to make it easier to operate the radio while driving. The third category of radio is the base station type radio. This is designed to be installed in an office or home and is usually the largest in size. Base stations probably operate off mains power, and require an external antenna, microphone, and possibly speaker too. With FRS/GMRS walkie-talkie (we’re going to abbreviate this to the term HT – short for handheld transceiver) units available in many different stores, ranging from of course Radio Shack to Walmart, from Costco to Target, and online too, both in specialty stores and of course Amazon , you’ll quickly discover a huge range of options, from as little as $10 per handset up to way more than $100 a unit. Amazon is currently displaying over 3000 results when searching for FRS/GMRS radios – sure, not all the results are actually unique different radios, but even so, this gives you an idea about the overwhelming multitude of these radios and related accessories. This buyer’s guide will help you choose the right units to match your needs and budget. So should you get an FRS radio, a GMRS radio, or one of the popular hybrids that have some frequencies from both bands? We suggest that your main focus should be on the GMRS capabilities of the HT. If it has FRS frequencies too, then that’s a bonus, but the main part of what you want are the GMRS frequencies. Why is GMRS better than FRS? Because you can have external antennas, more power, and repeaters. Using one, two, or all three of these features can transform a FRS walkie-talkie plaything with maybe a mile range at best to a workhorse reliable useful GMRS radio with potentially a range of 50 miles or more. Talking about range, let’s move on to this massively misrepresented topic. Most consumer walkie-talkies (HTs) are differentiated mainly by the manufacturer’s bold and prominent claim about the potential theoretical ‘up to’ maximum range of the units. You’ll see it is common for a manufacturer to offer a series of different models, starting off with an inexpensive unit with short-range, and going up through several steps to the most expensive unit with the longest claimed range. Now for the ugly truth. It is our perception that all the units in a given design series probably have identical radio electronics inside them, and therefore, identical range capabilities. Unless you can see a difference in the antenna, you’ll probably get the same range from the unit claiming a 6 mile range as you will from the unit costing three times as much and claiming a 36 mile range. Oh – and you can forget about both 6 and 36 miles of claimed range. Neither unit will give you more than a mile in range in normal conditions, and more commonly, they will give no more than half a mile. You’ll find it hard to ignore the glossy brochures and marketing claims about one radio being better and having longer range than another; but trust us rather than the marketing folks at the various different companies who make the radios. Ignore all range claims. If you want to understand range, there are other ways you can reliably infer as to the respective range capabilities of different units, but the ‘maximum range of up to ….. miles’ statement is totally useless and without any value. The thing that will have the most impact on your radio’s range capabilities – for both transmitting and receiving – is its antenna. Ideally the radio should be capable of taking external antennas. This is typically done by unscrewing the antenna on the radio and then connecting a larger/better/remote antenna to the unit, via the appropriate connector. There are three or four commonly found connectors, and there are adapters to allow items with different style connectors to be joined together so don’t worry about whatever type of connector any particular HT has. FRS radios are not allowed to have external antennas, but GMRS radios are, so if you get a combined dual purpose HT, look for ones that allow external antennas. This is the most important feature to find on an HT – even if you are just wanting to use the HT as a pocket/portable radio, you will still find extraordinary improvements in range by simply swapping the standard antenna that came with the HT for an after-market one (see our article on how to improve your HT’s range for more details on this). In terms of the antenna on the radio itself, as a quick rule of thumb, the bigger it is, the better, at least up to one-quarter of the frequency’s wavelength. The ideal length of a ‘quarter wave whip’ type antenna for FRS and GMRS is about 6″ long. The adage ‘You get what you pay for’ is not always true. In the case of most consumer style handheld transceivers (HTs) it is often not the case at all. Our perception is that most of the major manufacturers release a range of different models with perhaps some cosmetic differences between the units, maybe slightly different packaging and included items, and different marketing claims for potential range, but with no relevant difference in the internal electronics of the units whatsoever. You’ll get as good a receive and transmit capability with the cheaper units as the more expensive ones in the same ‘family’ of radios. So try to break the habit that the manufacturers are counting on you to follow, and don’t assume that the more expensive unit is in some mysterious way better than the cheaper unit. Unless you actually see a specific different feature set between the units, and unless the more expensive unit’s extra features are ones that you truly need, don’t spend any more than the entry-level unit costs (within a particular manufacturer’s range). What is it about radio transceivers that seems to encourage dishonesty on the part of the manufacturers? Not only do they make shameful claims about the range capabilities of their units, they also get totally carried away when it comes to making claims about the number of frequencies the units support as well. They’ve made the matter so unnecessarily complicated that it has required a 2300 word article from us to untangle their marketing mess! Please go read our article ‘Explaining the Confusion of Frequencies and Channels with FRS/GMRS‘ to get a full understanding of what the numbers mean, are, and should be. So we’ll assume you’ve read our other article, and now understand about the 7 unique FRS frequencies, the 7 frequencies shared by FRS and GMRS, and the 8 pairs of repeater frequencies for GMRS – in other words, 14 FRS frequencies and either 15 or 23 GMRS frequencies, and a total between both services of 30 frequencies. Hybrid FRS/GMRS radios do not always come with all 30 frequencies. From your point of view, the most important thing is to get as many GMRS frequencies as possible. If there are some FRS frequencies in the radio too, that’s a bonus, but the key thing is to try and get as many as possible of the 23 GMRS frequencies. As for CTCSS and DCS, if you expect you might use a repeater in the future, you’ll want radios that support both these features. If you know you’ll never use your radios with a repeater (and who among us can confidently say ‘never’ about anything?) then by all means get radios without CTCSS and DCS, because you’ll never want to use them except in repeater operation. They are dangerous rather than helpful features. Your radio will come with either a rechargeable battery or regular batteries or possibly it will be capable of using either. The least desirable option is a radio that has a unique size/shape of battery (which by definition would be a rechargeable type), and the battery being a Ni-Cd type battery. Nickel cadmium batteries are massively inferior to Nickel Metal Hydride batteries – they store less charge, they can’t be recharged as many times, and you have to fully discharge them before fully recharging them. Half discharging and/or half recharging them will reduce their capacity via what is called a ‘memory effect’. Ni-MH batteries have much less memory effect, but still have a little, and the latest ‘Eneloop’ type Ni-MH batteries have long life, higher capacity, and can be charged up to 1500 times. As a side-bar type comment, you should use these Eneloop batteries as your main battery resource for all your electronics. They cost a bit more up front than other rechargeable batteries, but they’ll give you much longer life, and as preppers, that has to be our key consideration. Slightly better is a unique size/shape of Ni-MH battery. Slightly better again is a unique size/shape of Li-Ion battery. Lithium Ion batteries hold more charge than Ni-MH batteries, and can be recharged more times, and have little or no ‘memory effect’. But you don’t want a radio that requires unique types of batteries if you can avoid this, because that locks you into a specific battery from a specific supplier. The more generic all your consumable items are, the easier it is to keep a stockpile of them and to possibly resupply them subsequently. So the best battery option is a radio that takes normal AAA or AA batteries, because then you can load them up with regular batteries or with rechargeable Eneloop type Ni-MH batteries. Some radios have adapters so that you can, for example, load three AA or four AAA batteries into it. That gives you even more flexibility, and in particular, would allow you to have three single use 1.5V batteries (4.5V total) or four rechargeable Ni-MH batteries (4.8V total) to drive the radio at more or less equal power with either type of battery. Note that if a radio is designed to run on regular single-use alkaline type AA or AAA batteries, if you use rechargeable batteries instead, you’ll probably get less transmitting power, because the rechargeable batteries give out 1.2V per battery, compared to 1.5V per regular battery. That is 20% less voltage, which could mean as much as 36% less transmitting power, depending on the radio transmitter design. The radio’s receiving capabilities will probably not be any different, even with a somewhat lower voltage. Batteries should be easily accessed and easily changed, so that you can carry spare charged batteries with you when heading out somewhere. One more thing about batteries. I’ve read in some articles a misperception that more batteries means more power and better range. This is not really the case. Without boring you with a complicated electronic analysis, for the purpose of HT transmit power, you can safely assume there to be no link between whether the unit has two, three, four, or even forty batteries inside it. The unit will have been designed to perform optimally with whatever power level the batteries provide. Ideally you want to be able to charge a radio while it is switched on and operating, plus you also want to be able to charge spare batteries that you have, while they are outside the radio. This probably means you want some sort of cradle you can place the radio in to charge it, with the battery in the radio and the radio switched on, and you also want some form of charging batteries outside of the radio too. You want one charger for each radio you have, so you can charge them all simultaneously. Some chargers are ‘fast’ chargers and will charge a battery up in an hour or so. Others are slower and might take as much as eight hours to recharge a battery. The slower chargers are easier on the batteries. You’ll get longer battery life by recharging them slowly. On the other hand, fast chargers are easier when you suddenly discover your battery is dead and you have no spare battery to swap over. Perhaps a couple of fast chargers to allow you to quickly charge batteries for a pair of radios in that sort of emergency situation, and then the rest being slow chargers, and making sure to always keep spare charged batteries on hand. You also want some way to power your HT when you’re, for example, driving in a vehicle that doesn’t have its own mobile radio installed, but which of course does have 12V power available. The best option would be a way to both power the radio and simultaneously recharge its internal battery pack, the second best option would be a way to stop using the internal batteries and to start using the external 12V power instead. You’d also find a battery charger that is powered from 12V DC rather than 110V AC mains power helpful too. Read more in the second part of this series about more features and considerations when choosing the best GMRS radio for your needs. There have been a lot of changes in radio technology since this WW2 era SCR-300 early ‘walkie-talkie’. This is the second part of a two-part series on how to choose the most appropriate FRS/GMRS walkie-talkie for your requirements. Read about more features and considerations in our first part. This is also part of a broader series about both wireless communications and communications in general – you can see our listing of all similar articles for more information. In the first part of this two-part article we discussed the most important features to consider when choosing the best handheld transceiver, also termed walkie-talkie, and abbreviated HT. These were the unit’s range, antenna, price, frequencies, and battery/charging configuration. There are many more considerations to think about too – things that might not be quite so central to your use of the radio, but which can give it extra flexibility and convenience. Much of the time it is more convenient to free yourself from the need to hold the HT in your hand and talk into it and listen from it. An external microphone and speaker unit can add to the flexibility in use with the device. Some people like to use a headset/earpiece type unit so that the transmissions they are receiving don’t blare out all around them, but remain quietly private. These units typically have a microphone part way down the cord that runs back to the HT. Others prefer a traditional type handheld microphone that typically doubles as a speaker too, usually at the end of a coiled cord (make sure the cord is long enough). Some higher end professional grade HT units (and mobiles) may have more than just a ‘Push To Talk’ (PTT) button on the microphone. They might allow you to also switch channels, adjust the volume, and maybe do other things too. This is all good, but maybe you’re starting to over-engineer what you need in a simple handheld unit. Just so long as it has a PTT button, that’s the key thing for an external speaker/microphone. This means the ability of the HT to automatically transmit when it hears you talking – Voice Operated Transmission is what VOX is short for. VOX is a feature that some people occasionally need, but most of the time, it is best left off. If you find yourself in a situation where you need to use both hands to do something, and you may need to be using the radio too, then a VOX capability may be very handy. But a VOX capability often has problems. You might find you need to shout in order to activate it, you might find it cuts out and clips off some of your words, and you might also find that it comes on unexpectedly when you don’t want it to, due to background noises (or simply wind blowing over the microphone) activating the circuit. If you do select a unit with VOX, make sure it has adjustable sensitivity for how loud a sound will cause it to start transmitting. In normal times, using VOX may be acceptable. But if you are using your radios in a tactical situation where you wish to carefully control when and what you transmit, you’ll not want to risk the vagaries of VOX and you’ll make sure it is always switched off. Believe it or not, your objective is to always use the lowest power possible when transmitting. This saves battery life and also limits the area around you where other people can monitor your transmissions. If you have a combined FRS/GMRS HT, then it probably has a dual power setting anyway, with a 0.5W setting for the FRS channels as required by the FCC (this may be automatic or something you can select – and therefore override, too – yourself) and a higher power setting for the GMRS frequencies. The maximum power in a handheld unit is usually in the range of 2W – 5W; anything more powerful than that starts to raise concerns about the potentially harmful effects of the radio frequency energy you’re zapping yourself with. So you want a unit with at least two power settings. A few might have more than two power settings; that’s nice, but the chances are you’ll not often change the power settings other than switching between low and high so it isn’t the most essential feature. This is a big deal. How well can the receiver actually detect weak radio signals and convert them into useable audio for you? You want the most sensitive receiver possible. You’d prefer to have ‘super-hearing’ as a magical power than ‘super loud voice’, wouldn’t you, particularly if you wanted to be able to stealthily talk to other people and also listen in on opposing forces. So search out the receiver’s sensitivity, which is typically expressed in terms of the receiver’s sensitivity in microvolts for so many dB SINAD – eg, 0.25μV at 12dB SINAD. What this is saying is that if the receiver detects a quarter of a microvolt of RF signal, it will generate a 12dB audio signal out the other end. Better receiver sensitivity is something you should be willing to pay more for. And if you can’t find it disclosed in the unit’s specifications, then you can assume it is not very good. These days tiny handheld radios don’t have individual knobs and dials and switches for all their different features and settings. Instead, you have to go through a series of menus, with what are sometimes inscrutable prompts, to change the settings for just about everything. This is okay when you’re seated in your comfortable easy chair, and with plenty of time to work through the manual and to get the radio configured – with both the manual’s assistance and some trial and error – the way you wish it to be. But ‘in the field’, if you suddenly find yourself needing to make a change, it might be weeks or months since you last programmed the radio, and you find yourself under time pressure needing to do something you don’t remember how to do. You might think this would never happen, but there’s one very common scenario. The controls on the unit get inadvertently pushed and bumped, causing a random series of reprogramming commands to be accepted. So there you are with a radio and all you know is it is no longer working, but you don’t know why it isn’t working or how to fix it. That’s a nightmare scenario. Wait – it gets one better. You gave the radio to your elderly aunt to use, and she pushes the wrong buttons and/or bumps it and messes up the programming on her unit. She doubly doesn’t know what to do and can’t reach you to ask for help. Enter the solution – a keyboard lock command. This disables just about everything except the on/off switch, the volume control, and the push to talk button. That way your aunt can push buttons in any random order she likes, and the radio won’t change at all, and will remain working exactly the way it should. Make sure any radios you get have a keylock command, and as obscure an unlock action as possible! A few radios have been released in the last year or so with an optional voice scramble feature (eg the Midland GXT900). This sounds like a great feature to have, but there’s one very big problem with it. The FCC prohibits the use of scrambling, encryption, or codes when you’re using GMRS and FRS and Ham frequencies. Although our feeling is that the FCC is currently adopting a ‘live and let live’ approach to these bands at present, an egregious violation of their rules such as transmitting scrambled signals is something that other operators would of course notice and likely report to the FCC, and could result in an unexpected visit from FCC enforcement officers, all your radio gear being seized, and either substantial fines being levied and/or imprisonment. When the FCC does enforce, it can sometimes be quite heavy-handed with the penalties. We have no idea why radio manufacturers are selling radios with an illegal feature that could get you into trouble, and we have no idea how it is the FCC approved the radios in the first place, and the FCC is now publicly saying it may ban them in the future. So don’t get scramble-capable radios, and/or if you do, don’t use the feature, as tempting as it may be. Many HTs have built-in scanning capabilities, so you can not only use them to ‘work’ a known channel and a particular person/radio elsewhere, but can also monitor and scan some or all of the entire band of frequencies. This might seem like getting ‘two for the price of one’ – ie an HT and also a scanner – but generally we’d advise against it. If your primary purpose is to be ‘on-line’ for other people in your group. you don’t want to have your radio scanning through other channels when a call comes in for you. Furthermore, dedicated scanner receivers have useful additional features and capabilities that the basic scanning capability in HTs often lacks. Get a separate scanner if you want to be monitoring a group of frequencies just to see who/what is out there in addition to wanting to be able to keep in contact with members of your group on a specific frequency. A possible exception to this might seem to be if you have two teams in the field, one using one channel and the other using a second channel. Why have two radios then if you want to keep in touch with both – why not have one radio and have it scanning the two channels? Indeed, some radios have a special type of scanning feature – a dual channel mode where they’ll monitor two channels simultaneously. That’s a good concept, but it has a clear limitation, too. While your radio is locked onto monitoring active traffic on the first channel for the first group, it is probably no longer monitoring the second channel for the second group, and so while you’re listening to possibly low priority ‘chatter’ with the first group, you’re missing an urgent call from the second group. A radio’s squelch feature is an automatic circuit that turns the receiver off when all it hears is background noise and hiss. Without the squelch, you’d have a nasty roaring sound coming out of the radio all the time. Most radios have an ‘automatic’ squelch function that not only gets rid of all the background noise but might also cause you to miss out on some weak signal transmissions too – the squelch level is set too ‘high’ and so cuts off some bona fide real transmissions too. It is rare to find a radio with a manual squelch feature, but if you find one, it can be a good feature, although also a bit dangerous (if the squelch level is set too high). Some radios have the ability to program a set squelch level (eg low, medium, high) and in such cases, it is generally a good idea to override the default programmed level and make the radio more sensitive and more likely to play weak signals to you. Some radios also have a cancel squelch button which, when pushed, turns off the squelch entirely so you can hear everything that is happening without any filtering. This can be useful if you have a CTCSS or DCS code set on your radio (but hopefully you don’t use these privacy code features at all!). There can be a bewildering variety of additional features that these radios may also offer. Some of these sound nice when you see them on a brochure, but the chances are not only that you’ll never use them, but also that you’ll forget how to go through the programming menus to use them, too. Too many features can detract from a ‘bullet proof’ and easy-to-understand/operate radio which everyone in your group can be reliably counted on to use. Even more ‘dangerous’ is the fact that with an overabundance of features, there is the danger of setting a feature wrong which prevents the radio from correctly sending or receiving transmissions. An example of a ‘dangerous’ feature would be a ‘vibrate’ feature which will cause the phone to vibrate rather than to play the incoming signal through the speaker. If your phone is programmed to vibrate, and is not in your hand/on your belt, you’ll not realize it is vibrating when an urgent call is coming your way, whereas if the speaker was on, you’d of course here it. Other features are not so dangerous, but arguably not essential, either. For example, some may have a ‘Call’ button that transmits a loud tone, on the basis that the person you want to reach may not be listening carefully to every voice call that his radio picks up, but a sudden tone signal might catch his attention. Is that a gimmick, a useful option, or a ‘must have’ essential feature? You decide. Similar to a calling tone is a ‘Roger beep’. This transmits a short tone when you have finished your transmission. The theory here is that it clearly shows when you have finished talking. Some people like the Roger beep, others hate it. I actually quite like it – it makes for a clearer structure to who is talking and when they stop, but it is something that I could surely live without. Another feature is a weather band in the radio as well, so you can hear the automatic weather forecasts. This is something that is perhaps in the ‘nice to have, but I’d not pay a lot more to get it’ category. The best professional/industrial grade HT radios cost upwards of $500. You’re probably looking at radios costing a tenth that price, so you’ll probably need to make a few compromises in terms of features and functionality. Hopefully the information in this two-part buyers guide will allow you to understand which features are essential, which are valuable, and which can be ignored entirely. Please also see the first part of our GMRS/FRS Radio Buyer’s Guide for information on the most important of the features you need to consider. Lastly – or perhaps better to say, at the end of this two-part article series, we have another two-part article series in which we introduce you to the walkie-talkie radio we believe to be the best all-rounder great value radio for preppers and just about everyone else. Best of all, it costs less than $50. Set aside the better part of another $50 for some accessories such as one or two external antennas (for the radio and for when it is in the car) and some other bits and pieces (the second part of this new article series tells you exactly what you should get, why you should get it, how much it costs, and where to get it from), and you’ll have a system suitable for much of your short-range tactical radio communication needs. FRS/GMRS portable radios come in all shapes and sizes. If you collect any random group of radio owners together and asked them what they would most like to improve on their radios, the chances are most of them would emphatically say ‘more range’. Now, when we talk about greater range, it is important to realize there are two parts to a radio’s range. The first part is how far away its transmission can be heard, the second part is from how far away it can receive transmissions from other radios. There is usually little point in improving one part of a radio transceiver’s range without improving the other part as well. What is the point of being able to transmit further than you can receive (or vice versa)? The whole idea of a two-way radio transceiver is that you can communicate bi-directionally, both to and from some other person. On the other hand, if you made some tweak to your receiving circuit so you could now hear stations twice as far away, and if they were to do the same thing to their receiving circuits too, then that would balance out and you’d both be able to send and receive to each other again. So if you are seeking to optimize conditions among your own group’s radios, making an ‘unbalanced’ improvement to your radios is okay if you make the change to all the radios. And of course, always, any better performing feature is to be preferred to an under-performing feature. The most important thing you can do to improve your radio’s range – both for transmitting and receiving – is to improve its antenna. For some strange reason (mainly cost, secondarily size) the standard default antenna that most radios come with is very disappointing and does not perform as well as an antenna is theoretically capable of doing. A ‘good’ antenna may be a bit larger than the standard default the radio comes with (the ideal length for an ‘on radio’ FRS/GMRS antenna is about six inches) but that’s not a huge increase in size so is almost an essential ‘must do’ upgrade. A poster on a Yahoo group about the Baofeng UV-5R transceivers gave a great example of the impact the antenna can have on the radio. He measured the strength of transmitted signal from a UV-5R with its standard antenna, and with two different after-market antennas instead. The standard antenna gave a signal strength of -19 dBm. The first of the two after market antennas gave a strength of -12 dBm and the second one came in at -10 dBm (lower numbers are better). Now for the amazing thing. These are logarithmic measurements, so a 9dBm change is about the same as an 8.5-fold increase in transmitting power AND receiver sensitivity. Oh – the cost of this amazing antenna that converted the radio from an average performer to a super-performer (the Nagoya NA-701)? Less than $10 on Amazon ! Now if you have a FRS radio, you probably can’t replace the factory antenna, because it almost certainly comes with a fixed ‘hard wired’ antenna. The same is true of most but not all GMRS radios (especially the low-priced ‘blister pack’ consumer units). The importance of a good antenna can not be overstated, and so you should make this a part of your buying evaluation of radios – do they have removable antennas or not. A good antenna is by far the best thing you can do to improve your radio’s performance. It will give you a balanced improvement in both transmitting and receiving capabilities, and will give you the equivalent of a hugely overpowered transmitter, without breaking the law/restrictions on transmitter power, and without using up your batteries more quickly (which would happen if the transmitter was consuming power at a much greater rate). If you have a radio to be used in your car or at your home/retreat/wherever, you have more options for antennas without needing to be quite so concerned about antenna size/weight/portability. In particular, there’s another amazing transformation you can do for a fixed ‘base’ station, and that is to mount your antenna outside the building, and as high up as possible. Getting your antenna up higher not only gives a clearer line of sight to nearby radios, but also extends the line of sight distance for further away ones. At typical heights when your radio is being held to your head, the horizon is only 3 miles away (and if the other radio you are communicating with is also, say, 5.5 ft above ground level, then the total distance between you should be under 6 miles for line of sight conditions). But if your antenna is 20 ft up, you’ve almost doubled the distance to the horizon, and you could now be almost 9 miles away from the tower antenna. If your communications will always be in one general direction, you can also consider choosing a directional antenna to focus your transmitting power (and your receiving sensitivity too of course) in only one part of the hemisphere that otherwise radiates out from your antenna. Even if that is not the case, there can be advantages to having both a general antenna and also a very directionally focused one, and if you need to, switch from the general to the directional antenna and point it where the other radio you want to communicate with is, and that will surely give you another doubling or quadrupling of equivalent transmitter power and receiver sensitivity. Note : Please also see our two-part article on how to choose and install an external antenna for more information about improving your radio’s antenna. If you have a portable unit, maybe it is designed to operate with a rechargeable battery pack that it is provided with. If so, well and good. But maybe it is designed to work with standard AA or AAA type batteries, or perhaps even a 9V battery. If that is the case, there is a temptation to replace the standard single-use batteries with rechargeable Ni-MH batteries. Normally, this is a great thing to do, but rechargeable batteries (both Ni-Cd and Ni-MH) are 1.2V per battery, whereas standard single-use batteries are 1.5V. Rechargeable batteries have 20% less voltage. Your radio’s receiver will work pretty much the same with either voltage. But your radio’s transmitting power is probably proportional to the square of the battery voltage. In theory this is true, but maybe the radio has a voltage limiting circuit inside it and cuts down the voltage from the standard batteries and runs at full power with rechargeables. Assuming no voltage limiting circuitry, then with the rechargeable batteries, your radio might be only developing 64% of the power it would with the standard batteries. That’s an appreciable power reduction – not as significant as with an antenna change, for sure, but still an appreciable one, and if you’re in an area of marginal coverage, it might make all the difference between getting a signal out or not. What to do in such cases? Either use single-use batteries, or have an external power pack with sufficient rechargeable batteries to equate to or slightly exceed the standard battery voltage and a wire running in to the radio from the external power pack. Oh – in addition, if you’re in a marginal coverage area, make sure your batteries are reasonably fully charged. That could help, too. We suggest you get an external microphone/speaker or earpiece/microphone for your radio, so that when you are transmitting, or struggling to receive a weak signal, you can hold your radio not at your mouth but high above your head. Not only does this give your signal a bit more clearance, but it prevents your body from soaking up some/much of the signal. If this is not practical, at the very least, and as best you know where the other people you wish to talk with are, don’t put your body between the radio and the direction you want to transmit/receive. That can sometimes make a small bit of difference too. If there’s a big barn immediately next to you and blocking your line of sight to the other radio you are trying to communicate with, then (if the signal is poor) move so that the barn is no longer blocking you. If you’re in a small dip in the land, climb out of it and onto the highest ground you can find. While radio waves will go through objects to some extent, as a general rule of thumb, the more clearly you can see the other person you want to communicate with, the more clearly your radio signal will reach him, and the more obstructions between you, the lower the signal quality will be. The preceding items are about all you can do once you’ve bought your radio(s). But you need to consider performance issues when first buying your radios to start with. We’ll be writing about this separately and soon. In general, we suggest the most important part of your radio to optimize is its receiving ability. Think in real life – which super-power would you prefer : Super-hearing or a super-loud voice? Most people would choose super-hearing, and you should too. Your objective is not to be heard by everyone, everywhere, within an extraordinary radius of your radio. Rather, you want to be able to hear everyone – friend, foe, and neutral stranger – and communicate primarily with those you need to communicate with and ideally without being overheard by any more people than you absolutely can’t avoid. The less transmitting power you need and use, the better. That keeps your transmissions closer to ‘below the radar’ of other people who might be out there, and saves the batteries in your radio. This is part of a growing series of articles we are publishing on GMRS and related types of walkie-talkie radios. You can see everything to do with all sorts of communications here (both wireless and wired). 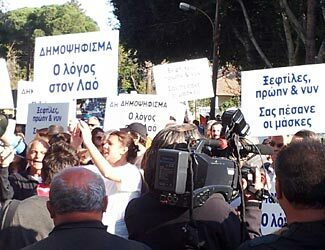 Cypriot citizens protesting the EU imposed raid on their bank savings. As we described in detail in our eight times updated article about the Cyprus banking crisis (which you really should read if you haven’t already), the EU forced the Cypriot government to seize funds from private bank accounts in that country to partially fund the EU’s ‘bailout’ of the Cyprus economy. Although private individuals, the world over, have reacted with astonished horror at seeing a government suddenly abrogate every notion of the sanctity of private property and swoop in and take money from people on an arbitrary and colossally unfair basis with no prior public debate or discussion, the financial markets reacted calmly – this would be expected, because the money being taken out of ordinary regular bank savings accounts was seldom money held on behalf of major financial institutions, and the bailing out that it was funding would generally benefit those same institutions. So, after noting the totally self-serving lack of disapproval by financial institutions, the Chairman of the Eurozone (the grouping of EU nations that use the Euro), Dutchman Jeroen Dijsselbloem, has claimed that this gives him the authority to insist on similar actions in other countries in the future. This marks a huge reversal of public policy. Previously, while smaller EU bank depositors were given a €100,000 guarantee by a process similar to our FDIC guarantee (which goes up to $250,000 here), larger depositors were also protected by an ‘unwritten’ understanding Quite sensibly, the EU and its Eurozone subgroup wanted to instill confidence in bank depositors. A 100% safe banking system is one of the essential building blocks of any economy and currency; without a reliable banking system, the entire economy becomes dysfunctional. But the Eurozone has now decided that it will risk the integrity of its banking system, and has gone on record as saying that if a participating nation and its banks get into trouble, it will consider funding at least some of the bailout by seizing funds from bank depositors. The next two countries likely to feel the impact of this new approach will be Spain and Italy. So why are we writing about matters in the Eurozone? Aren’t we supposed to be focusing on things to do with prepping in the US? This is an important issue that you need to understand, because it is an early signal of what could happen here. Goodness only knows that our economy is in as bad a shape as any European economy, and there is no sign that our deficits will convincingly shrink at any point in the future. Government spending as a percentage of total GDP seems predestined to only grow and grow and sooner or later must reach a tipping point where everything collapses. This is not a matter of ‘if’. It is a matter of ‘when’. The US economy is like ‘the emperor’s new clothes’ – it only continues to work as long as no-one questions its validity. It is perhaps also an example of the saying ‘If you owe a bank $100,000, then the bank owns you; but if you owe a bank $100,000,000, then you own the bank’ – in this case all our creditor nations consider that it is in their best interests to continue to support the US dollar and US economy, but if (when?) they no longer feel this to be in their best interests, our economy could collapse as quickly and as spectacularly as any third world nation. Currently we as a country are ‘too big to fail’, but as our economy continues to become a smaller and smaller share of the total world economy, our status as ‘too big to fail’ becomes more and more questionable. What would happen if we lost the support of our creditor nations? What would happen if we could no longer fund our deficit spending, and if our creditors would start to call back the money we owe them rather than rolling it over again and again? Which brings us to the implications about developments in the Eurozone for us here in the US. What we are seeing in the Eurozone is a callous calculated decision that if governments and their largest banks get into financial trouble, it is now becoming acceptable to turn to private citizens to bail them out, and to arbitrarily just take money from people on any basis that is quickest and easiest for the government. In the case of Cyprus, and as is now being threatened for other European nations too, this is in the form of simply taking a flat percentage of the money you have in your bank accounts. Europe is a stable grouping of nations in which the rule of law and concepts of due process, democracy, and protecting the private ownership of assets are all well established universal principles. But when they are faced with financial expediency, we have seen how quickly these bedrock principles have been abrogated and abandoned. Could it happen here, too? You bet! What would happen – to you, and to our society – if it did happen? For yourself, personally, you need to realize that this would be a sudden event with little or no warning. One day our President and his advisors might wake up and say ‘Heck, it’s time to put a stop to this ever larger burden of debt around our neck’ and before the day is out, have enacted regulations to free all bank accounts and passed any necessary legislation to authorize the taking of bank funds. To succeed, it would have to be done with no prior warning; otherwise people would urgently withdraw money from their banks. The worst part of this scenario? The government would probably have the enthusiastic support of much of the country behind them. The 50% of the population who pay no tax and may instead be net beneficiaries, receiving government support, have become so immersed in the selfish concept of personal entitlement that they’d be delighted to see the ‘rich people’ being forced to ‘contribute their fair share’ some more. Bottom line? You can no longer rely on the safety of your money in any bank. And that FDIC guarantee? Just like the government could increase it from $100,000 to $250,000 back in 2008, there’s no reason why it couldn’t decide to reduce it down to $25,000, or to withdraw it entirely. The FDIC guarantee is, as it proudly says, ‘backed by the full faith and credit of the US government’ – but what happens when the government acts in bad faith, or when the government runs out of credit? We’ve seen both those eventualities occur in Cyprus, and now being threatened elsewhere in Europe. For society as a whole, there is one significant difference between the US and European countries. We have an armed citizenry. Would the riots, stone throwing, arson and such like that have been a constant backdrop in troubled countries such as Greece whenever their government announces proposed austerity measures become something more violent in the US if the government announced a taking of a large slice of our savings? Quite possibly so. Which might be why the DHS is equipping itself with such an extraordinary amount of ammunition, armored vehicles, and automatic weapons. Is this the event they are anticipating and preparing for? The irony is that many of the people who would violently protest are people who would not be affected at all by a government seizure of personal bank accounts. They’d be opportunistic rioters/looters rather than truly aggrieved citizens facing the loss of a large slice of their life savings. But in a way, that makes such an occurrence more threatening rather than less threatening, because these anarchistic ‘protesters’ can not be reasoned with and won’t respond to calls for fairness and peaceful protesting. Clearly, if such a thing happens, no matter what your own feelings on the fairness of the government’s actions might be, you’re going to want to get out of Dodge quickly. Don’t under any circumstance participate in protests, peaceful or otherwise. You don’t want to be caught up in any such civil disturbances, and you doubly don’t want to be caught up in any arbitrary ‘sweeps’ by armed-to-the-teeth DHS forces seeking to ‘restore order’. Do you know how many channels your FRS/GMRS radio can transmit and receive on? UPDATE : OCTOBER 2017 : New frequencies and rules have been set by the FCC. We explain the new FCC changes to FRS/GMRS services here, and list the new FRS/GMRS frequencies and rules here. The rest of this article, below, remains helpful and relevant and you’ll still benefit from reading it, but the specific frequencies have changed. 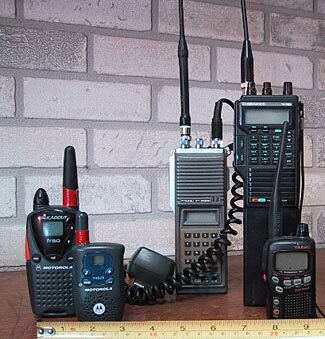 It should be really simple to understand the different frequencies available for FRS and GMRS radios. The FCC publish two short lists, one of the 14 FRS frequencies, and the other of the 23 GMRS frequencies. So what else do we need to say, except to copy those lists? Well, unfortunately, radio manufacturers have deliberately made it as complicated as possible to understand exactly what their radios do and don’t have, to the point of making some claims which are hard to describe as anything other than outright lies. The fact that seven of the FRS frequencies are duplicated as seven of the GMRS frequencies doesn’t help, and the further fact that 16 of the GMRS frequencies are in the form of eight paired frequencies for repeater use makes it a bit more complicated still, and then add to the confusion the fact that there are no formal universally adopted numbers or names for the different frequencies, with different manufacturers numbering the frequencies differently, and you have a definite recipe for confusion. There is a technical difference between the concept of channels and frequencies. But in this article we are generally using the two terms interchangeably, so if you see us talking about a FRS channel in one place and a FRS frequency somewhere else, we are probably talking about the same concept. Feel free to skip on to the next section on privacy codes at this point. But, for the more technically minded, the different channels that these radios operate on each take up one specific frequency. For example, the lowest frequency used is 462.5500 MHz, and the next lowest frequency used is 462.5625 MHz. We could consider these two frequencies as each representing a channel. In theory, with the right equipment, you could use any frequency at all – 462.3456789 MHz or any other frequency that took your fancy. But for good and sensible reasons, the FCC has directed radio traffic onto specific frequencies. Think of this a bit like marking lanes on the freeway – traffic flows much more smoothly (and safely!) if there are clearly defined lanes on the freeway, and similarly, radio traffic flows best if there are clearly defined channels. You know this already, possibly without realizing it. Think of tuning your AM or FM radio. There might be an FM station at 98.7 MHz but there isn’t another one at 98.75 MHz, is there. There might be an AM station at 880 kHz, but there’s never one at 883 kHz. So we are referring to each of the officially assigned frequencies as a channel. Simple, isn’t it. Now for the nuisance part. With many types of radio service, there is a unique channel number associated with each and every frequency that can be used. This is true of CB and of MURS radios – indeed, with MURS there are both channel numbers (1 – 3) and also two channel names (Blue and Green). This is also usually true of a radio that only has FRS frequencies in it. Channel 1 is always the lowest frequency and channel 14 the highest frequency. But, because of the overlap of frequencies, it is not true of GMRS radios and it is not true of combined FRS/GMRS radios – indeed, not all FRS/GMRS radios even have all 30 possible frequencies to start with. Generally a manufacturer will follow the same numbering plan for all their radios, but there’s every chance that the frequency associated with a given channel number on (for example) a Cobra radio might be difficult from the frequency associated with the same channel number on (for example) a Uniden radio. Don’t worry, there’s a solution. But there’s a bit more to tell you before we get to the solution. This is where the manufacturers like to start playing games. The short answer – ignore the ‘feature’ entirely. The longer answer? Keep reading. You can only have one transmission at a time on a channel – you know this already, probably. If you and your friends/family are wanting to have a discussion on a channel, then if someone else and their friends also want to communicate at the same time, they are either going to have to share the channel you are on, or else, switch to another channel. Most of the time of course, people will switch to another channel. If they can’t find a free channel, well, then it might get a bit ugly. Depending on how polite everyone is, either they’ll share it nicely, or else some users will attempt to rudely broadcast over the top of other users and pretend they are not there. So clearly, the more channels available to you, the better it will be in a case where there are lots of other people wanting to use their radios at the same time. One more point, then we’ll come to privacy codes. You also know that when you transmit your message, anyone else, within range of your radio, and with their radio tuned to your frequency, will hear it. You can’t create any sort of privacy or blocking, short of ‘scrambling’ (aka encrypting) your transmission, and the problem about scrambling your transmission is that it is illegal. The FCC doesn’t allow you to do that. Now for the privacy codes. Actually, they should be called ‘non-privacy’ codes, because they don’t give you any privacy at all. Quite the opposite. If you use a privacy code setting on your radios, everyone can still hear you, but you can no longer hear everyone else! Like we said, it is a non-privacy code. It is like putting hearing protectors on at a gun range. So what are these (non)privacy codes? There are two different types – CTCSS and DCS. They both operate in similar ways, and what they do is they add a code or inaudible tone to your transmissions, and set your receiver to only play transmissions with that code/tone added to them. This can – in very limited situations – be a good thing. Maybe you have two teams playing a match. Team A sets privacy code 32 to their radios, and team B sets privacy code 17 to their radios. As long as no-one cheated in either team and turned off their privacy code, then that would restrict messages. But the weakness is that the ‘privacy’ relies on the other person doing something, not on anything you can do. There’s a very important thing to appreciate. Think again to team A with privacy code 32 and team B with privacy code 17, and all sharing the same channel. They can’t both be sending messages to their respective teams simultaneously. The channel can still only support one transmission at a time. The different privacy codes don’t create ‘sub-channels’ that can be used simultaneously. This exposes another weakness of the concept. If you have a privacy code set, you won’t hear all the other users – those with no privacy code at all, and those with different privacy codes – on your channel, and unless you have a radio that won’t transmit on a channel that is already in use (this is a high-end feature seldom found on consumer radios) or unless you have a way to turn the privacy code off and check the channel is free before then turning it back on to transmit (yes, this is a hassle), you run the risk of transmitting at a time when someone else is already transmitting, and then the two of you will block/jam/interfere with each other, creating a confused mess for both people transmitting and anyone/everyone listening to them as well. You then get re-transmissions, and listeners transmitting saying ‘please repeat’ and what should have been simple and easy becomes complicated and extended. Yuck. There are some technical reasons why these codes can be useful and helpful, but for ‘normal’ users such as us, these reasons probably don’t apply. Instead, privacy codes are dangerously unhelpful, while giving you no privacy at all. They can eliminate the number of distracting messages that come in over your radio from people you don’t need to hear from, but when you talk yourself, your signal can be heard by anyone (as long as they don’t have a different privacy code set on their radio). We strongly recommend you do not use the privacy code features on your radios. But the marketers of radios don’t necessarily explain the problems of privacy codes to you. Quite the opposite. They’ll offer them up as great benefits to you, and they’ll also play games. Instead of saying ‘This radio has 14 channels and 25 privacy codes’ they’ll say something like ‘this radio gives you 350 different channel options to choose from’ – what they’ve done is they’ve worked out all possible different combinations of privacy code settings and channel settings. But your radio still only has however many channels, no matter how many privacy codes there might be. Some companies go a slightly different route to try and make their radios seem better than the other guy’s radios. On the channel selector button they might have numbers from 1 – 50 (as is the case with some Midland radios). Now remember what we started off by saying – in total, there can never be more than 30 channels in a FRS/GMRS radio. The FCC does not allow that. So how is it that Midland is saying ‘You should buy our radio, it is better than the Motorola radio because it has 50 channels instead of their 30 channels’? We asked Midland that question, and they never answered our email (shame on them). But some research showed that what Midland did is simply repeat some of the channels a second time, but this time with a privacy code setting as well. So, for example, maybe their channel 7 is identical to their channel 37, except for channel 7 normally defaulting to no privacy code, and channel 37 normally defaulting to having a privacy code. So suggesting they have 50 channels that could support 50 different users simultaneously is total nonsense. Read our lips : There are 14 FRS frequencies and 23 GMRS frequencies. Seven of these are shared frequencies, so in total, there is a maximum possible of only and exactly 30 frequencies. Not 31. Not 32. And definitely not (are you listening, Midland) 50! Per the official FCC website, here are the fourteen FRS channels. Per the official FCC website, here are the 23 GMRS channels. You don’t have to look too hard at these two lists to realize that seven of the channels are in both lists. The first seven of the FRS frequencies are shared with the 2nd, 4th, 6th, 8th, 10th, 12th and 14th of the GMRS frequencies. If you’re good at seeing patterns in numbers, you might notice that the last eight GMRS channels are exactly 5 MHz higher than eight of the earlier GMRS channels. These create eight pairs of frequencies to be used with repeaters, with the frequency on your radio’s transmitter being the higher frequency and the frequency on your radio’s receiver being the lower frequency. Most consumer radios do not support this type of split frequency operating mode and simply transmit and receive on the same frequency. You can use any of these repeater pairs for normal GMRS calling. As we mentioned above in the section on the difference between frequencies and channels, there is sometimes confusion between the channel numbers used by a radio manufacturer and the frequencies they assign to those channels. If you have two different radios, you need to carefully check and compare the frequencies associated with each channel number. This is always shown somewhere in the manual that comes with the radio. We suggest you take a copy of our table here, and then locate each frequency on the left hand side, and write the corresponding channel number assigned to it by your radio in a column on the right hand side. That way, if you have multiple different makes/models of radios, you can then easily see ‘Ah yes, channel 6 on your radio is the same as channel 12 on mine’ or whatever else may be the case. Note that we’ve numbered the repeater pairs (RX for repeater output, TX for repeater input), but this only matters if you’ve a repeater capable radio. Otherwise, ignore our numbering. Some manufacturers have exploited the confusion that can possibly arise in the minds of non-technical prospective purchasers of their FRS/GMRS radios and have created fanciful claims of their radios having many more frequencies on it than it really truly has. There are a maximum of 14 frequencies possible on FRS radios, and a maximum of 23 frequencies possible on a GMRS radio. Due to seven of these frequencies being combined FRS & GMRS, a dual purpose radio can have a maximum of 30 frequencies, and may have less. Because of the way the frequencies have been intermixed between FRS and GMRS, different manufacturers number the frequencies differently on their channel selectors. You’ll need to carefully match their numbers with the frequencies they relate to, and using the table above can help you ‘translate’ between the numbers/frequencies on one radio with the different numbers and frequencies they are assigned to on another radio. This article is one of a series of articles on using radios at your retreat (and anywhere else too of course). Click to see our full section of articles on communications topics. These Cobra FRS/GMRS units are typical middle-of-the-road units. In a future ‘grid down’ situation, your normal cell phones will almost certainly not be working. These days we’ve grown so accustomed to being always in touch with everyone, no matter where we are or where they are, that we’ll almost certainly want to recreate some form of ubiquitous communications, at least with other members of our retreat community and possibly with friendly nearby neighbors, too. 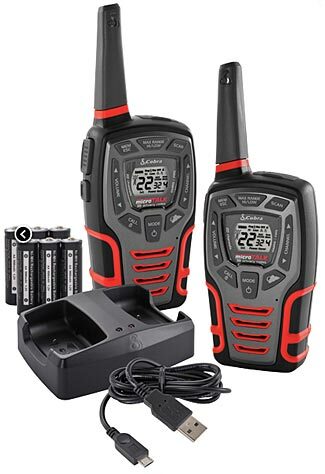 There is a wide range of different types of radios that can give you this ability, ranging from little more than $10 each and up from there to $1,000+ each. Many of these radio transceivers (ie a radio that both transmits and receives) require some sort of official FCC license to operate. Some types of license simply involve paying a fee to the FCC, other types of license require you to pass a skills/knowledge test about radio theory and practice. Other types of radio require no license at all. The good news is that the types of radio that require no license at all (there are four main types – CB, MURS, FRS and GMRS) are generally the least expensive, most readily available, and probably all that you need for most of your survival requirements. Sure, the fancy and expensive Ham and commercial radios might be more appealing, more powerful, and more functional, but unless you’re going to go through the necessary licensing steps to qualify for operating these types of radios (anyone can buy and own these radios without having to show or prove their licensing authority to operate them, but as soon as you press the transmit key, you’re committing a moderately serious offense if you aren’t already appropriately licensed) you’re best to leave them alone. See the next section for why we strongly recommend you follow all FCC restrictions, requirements and regulations. We always urge you to conform to all laws, even in a period ‘without rule of law’, because you don’t want to create any type of vulnerability, either before, during or after any type of Level 1/2/3 situation. You might think ‘WTSHTF no-one is going to care if my radio is licensed or not’ but you’d only be partly right. First of all, what happens prior to when things all go wrong? How can you practice and rehearse for such situations with your radios without breaking the law if you don’t have the appropriate licenses? You’ll definitely want to get familiar with your radios, and the coverage areas they provide you, and which channels are most free of interference; that will require extensive use of your radios long before any type of problem scenario. Secondly, there will be patches of semi/pseudo law and order, even in the depths of a Level 2 or 3 situation. If you’ve ever talked to a policeman, you know they boast ‘We can always arrest you for something’. Maybe that’s true, but don’t make it any easier than unavoidable for them to find a reason to arrest you. If you and the interim authorities get offside of each other (and we do foresee unavoidable tensions between the unprepared majority and the well prepared minority, with the former seeking any excuse or authority at all to confiscate food and supplies from the latter), you desperately don’t want to give them any sort of reason to confiscate any of your prepped supplies, and/or to ‘fine’ you or lock you up. Thirdly, at the end of any such situation and with the return of normalcy, anyone you may have upset during the lawless period can now attack you – hopefully not physically, but definitely legally, using any of the laws that you may have broken during the crisis situation. Can you rely on the grey suited faceless government bureaucrats – perhaps the same people who were going hungry while you were restricting your own limited supplies for your family – saying ‘Oh, don’t worry about it, they were tough times for us all, the important thing is you survived, never mind how many laws you broke in doing so’? As we mentioned above, there are four main types of radio service which you can use without needing a license. All of these are covered by Part 95 of the FCC’s regulations. We recommend you concentrate on the FRS and GMRS type of radios, so let’s explain the differences between the four radio services and why FRS/GMRS is probably the best choice for most people. You probably remember CB radios (CB stands for ‘Citizens Band’) from the 1970s – they became very popular after movies like ‘Smokey and the Bandit’ and many people had them in their cars. But after only a brief period of general popularity, they faded back into obscurity and while they are still out there, and while they are still used by many truckers, these days most ‘normal’ people never have any contact with CB radios. CB radios can have as good or even better range than FRS/GMRS radios when outdoors but not so good indoors (and are still basically limited by line-of-sight considerations), but they require very large antennas for good range (about 9′ as a good compromise length – a quarter wavelength). This is practical at a ‘base station’ – ie in your retreat, it is possible in a vehicle, but is very much less practical in a portable radio – a ‘walkie talkie’. Furthermore, over the last decade or more, radio manufacturers have lost interest in CB radio (there are fewer companies making them, fewer models available, and very little in the way of new models or feature), and there are not many high-end models available as portable sets. That’s not to say you don’t still have a reasonable selection, as you can see from Amazon’s several pages of listings. If you only wanted communications between vehicles and base stations, maybe CB radio is still a possibility, but why would you want to limit yourself to only base and vehicle services? Whatever you use has to be useful in all three types of applications – base, mobile, and portable. For the sake of completeness, we’ll tell you some more about CB radio. It was established back in the 1940s, and originally was a licensed service. In 1983 they became unlicensed (largely because during their surge of popularity in the 1970s, many people didn’t bother licensing them and it seems the FCC gave in to the inevitable), so now anyone can operate a CB radio without needing an FCC license. The radios can be used for both business and personal communications. There are 40 AM channels in a range from 26.965 MHz to 27.405 MHz (channel 9 – 27.065 MHz is an emergency calling channel, and channel 19 – 27.185 MHz, is a general ‘hailing’ channel to contact other people). The channels from 36 – 40 are often used in a SSB form which gives the signal more range and power (all channels could be used in SSB mode but by convention only the upper five channels are used that way). CB radios can have external antennas, and are limited to 4W in power, or 12W in SSB mode. In years gone by, it was common to see a lot of illegally modified CB radios – typically either with too much transmitting power (some would go as high as 1,000 Watts) or tweaked for non-standard frequency operation. Even now, with only a bit of searching, you could probably find ‘linear amplifiers’ for power boosting and radios capable of transmitting on non-official frequencies. But if that appeals, maybe you should re-read the preceding section on keeping everything legal! Here’s an FCC summary explanation of CB service. For full details of any of the four types of service, you should click the link to their full Part 95 regulations. The Multi-Use Radio Service, or MURS for short, is the newest of the four services. It was established by the FCC in 2002. There are five VHF FM frequencies (in a range from 151.820 MHz to 154.600 MHz) and they can be used for business or personal use, but can not be patched into the normal telephone system. MURS radios are limited in power to 2W, and can have external antennas. Repeaters are not allowed. MURS is an okay alternative to FRS/GMRS, although with 2W maximum power, they may have more difficulty reaching their theoretical maximum (ie line of sight) range). Unfortunately, there are very few MURS radios out there, and they tend to be more expensive than the FRS/GMRS radios, so we prefer to focus on FRS/GMRS to the exclusion of MURS. Here’s the Amazon page of MURS radios. Currently it seems there’s nothing less than $80 per radio, whereas the FRS radios can be had for as little as $10 each. Here’s an FCC summary explanation of MURS service. The FRS (Family Radio Service) was instituted in 1996. The rules associated with it are designed to allow for only very limited range communications, which can be for either business or personal purposes. The radios can not have external antennas, and are limited to a maximum power of 0.5W. There are 14 FM different frequencies, the first seven of which are shared with GMRS radios. They range from 462.5625 MHz to 467.7125 MHz. Manufacturers have started offering FRS radios at amazingly low prices – it is not uncommon to see a pair of them being sold for $50 or less. As you can see, Amazon has a lot of different FRS radios, with some as inexpensive as $20 a pair. You will also see that the radios are being advertised as having range capabilities up to 36 miles. Do not believe this nonsense claim. Well, to be more specific, if you were up the top of a ship’s mast on the unobstructed ocean, or if you were on the top of a mountain, and looking over to a person that you could see (through a telescope) free of obstructions on the top of another ship mast or mountain, then maybe – just possibly maybe – you could get a signal to punch through. But for the real world, with obstructions between you and the people you’re wanting to communicate with, you’ll probably get something less than a mile, and often very much less. One more thing about these offensively incorrect statements about range capabilities. Don’t think that a radio with a claimed range of 36 miles is better than one with a claimed range of 24 miles, or any other range. Typically there are the same identical radio electronics inside the different models of FRS radio; the main difference is the packaging, the marketing hype, and the price. So the good news about FRS is that the radios are very inexpensive. The bad news is the radios are good for only very short-range communication. But even the lack of range is a mixture of good and bad news. You don’t want strangers, five miles away, to be able to listen in on your communications or even to know you’re out there at all. If low powered FRS radios give you the range you need around your retreat property, but don’t reach much further, then that is a good rather than bad thing. Also, with low transmitting power comes longer battery life. There’s a lot to like about FRS radios, and you need to realize that sometimes short-range is a good rather than a bad thing. Here’s an FCC summary explanation of FRS service. Yes, we’ve deliberately left what we view to probably be the best radio service until last. The General Mobile Radio Service has the same 1940s origins as CB radio, and, the same as CB radio, has evolved over the years. Although CB’s evolution has brought us to an easily understood point today, the same is not quite as true for GMRS, which is in a period of regulatory transition at present. The distinctive thing about GMRS is that it uses similar, and in some cases, identical frequencies to the FRS radios, but usually at greater power and with fewer restrictions. This meant that it didn’t take too long after the release of FRS frequencies in 1996 for manufacturers to start selling dual-purpose radios – higher power for GMRS and lower power if you switched the radio to its lower power setting for FRS. But whereas FRS has always been a license-free service, back in 1996 GMRS required a license – either a business or a family license – to be used. So the manufacturers were being slightly naughty selling radios that combined FRS and GMRS capabilities, and selling them at retail rather than through specialty radio stores, and with only the smallest of small print somewhere telling the purchaser that to use all the frequencies, and on high power, it was necessary to now go fill out a form and pay a license fee every five years to the FCC. The five-year license fee ($85) is often very much more than the person spent to buy two or more of the walkie-talkie radios. You’ll be unsurprised to learn that lots of people bought the more powerful combo radios, and almost none of them bothered to get FCC licenses. At first, the pre-existing GMRS licensees were appalled at their quiet uncongested ‘sensible’ channels suddenly getting shared with unregulated users, often young children just having fun in the back yard, and the FCC tried to enforce its licensing laws. But it became plain to the FCC that, just like with CB radio licensing in the 1970s, this was an unwinnable fight, and what could it do, anyway? Even the nastiest FCC official didn’t really think it fair to send a family – mom, dad, and the kids too – to federal prison for two years because they’d bought a pair of radios at Office Depot or Costco or Target or wherever, didn’t read all the pages of fine print, and were just simply having fun with them. And the cost of trying to go after probably hundreds of thousands (if not millions) of law breakers was just impossible for even the federal government to consider. So they unofficially gave up on enforcing the requirement for licenses, and in 2010 published a proposal to officially remove the licensing requirement for GMRS radios (and also to change power limits and some other things too). Strangely, the proposal has languished somewhere in the FCC and is still pending, unresolved, nearly three years later, as we write this in March 2013. So at present the theory says you need to buy an $85 five-year license to use GMRS radios, but the FCC no longer seems to be enforcing this. GMRS radios are allowed to transmit up to 50W of power, although we’re unaware of any handheld GMRS devices that do this (they’d eat through batteries tremendously quickly, and might be dangerous in terms of too-strong RF emissions too close to you). Some of the base stations and mobile units do use this much power, though, and that really helps you punch your signal a bit further out, and through obstructions on the way. GMRS radios can have external antennas, and can be used by either the licensee’s family or the employees of a licensed business. We expect this will probably become ‘can be used for personal or business use’ once the requirement for licensing is removed. You can’t connect a GMRS radio into your phone system. We’ll talk more about range another time, but suffice it to say that while more transmitter power doesn’t always guarantee more range, if all other things are equal, more power can often help provide additional range out to the end of ‘line-of-sight’. For a portable handheld transceiver and a short stubby antenna, with probably 1W or 2W of power, you’ll get similar or slightly better range than with an FRS unit. Unique among these four radio types is permission to operate repeaters for GMRS radios. This can massively extend the range of a GMRS based system, allowing it to reach out potentially 50 or more miles, depending on the topography of the area in which you live. There are 23 FM frequencies assigned to the GMRS series. Sixteen of these are in the form of eight frequency pairs for repeater operation, and the other seven frequencies are shared with FRS service. Frequencies range from 462.5500 MHz to 467.7250 MHz. There are many GMRS radios to choose from, ranging from ‘consumer’ grade units that are usually dual purpose FRS/GMRS units up to ‘prosumer’, professional and commercial grade units. The consumer type dual purpose units cost little more than FRS-only radios, the high-end units can cost plenty more than $100 each. There are two major points of differentiation between consumer and professional/prosumer/commercial units. The first is the more expensive radios have better receiver circuits and can take external antennas – these capabilities will have more impact on your radio’s effective range than its power output. The second is that the more expensive radios will be capable of operating in both ‘normal’ mode (what is termed ‘simplex’) and also in split mode, with different frequencies for sending and receiving, a mode which allows the radio to work with a repeater. You can see Amazon’s extensive range of GMRS radios from the link. As with the FRS radios, ignore the ludicrous claims of enormous ranges. Remember also – don’t think that, whatever the range truly is, that because one radio costs $40 and claims a 30 mile range that it ‘must’ be better than a radio costing $30 and claiming a 20 mile range – they probably have identical circuitry inside. 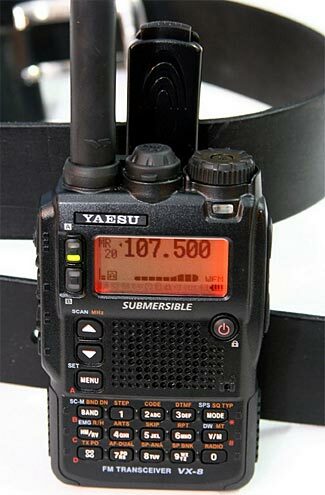 More professional GMRS radios are typically sold by industrial and Ham radio manufacturers and are described as being in the 70cm band or UHF or will show the frequencies they can operate as ranging from somewhere below the start of the GMRS band to somewhere above the end of the GMRS band – sometimes as broad as 400 – 520 MHz. Not all of these radios though are certified for use with GMRS service. The FCC might have certified them for Ham radio service (Part 97 of their regulations) and for private land mobile radio services (Part 90) but perhaps the manufacturer didn’t request Part 95 certification too. That may pose a slight ethical dilemma for you. If you want to be able to lawfully use more powerful and sophisticated radios (although, alas, they’ll be more expensive, too), if you’d like the flexibility of additional frequency bands (that fewer other people will be likely to be accessing or using too), and to have additional capabilities and longer ranges, then you probably should become a Ham radio operator. The good news is that – these days – there’s no need to learn Morse code. For a basic ‘Technician’ Ham license you need to learn about some aspects of radio theory, law and operation, and then sit a test with 35 multi-choice questions for which you must get 26 correct. You can see a list of about 400 multi-choice questions from which the 35 questions will be semi-randomly chosen in advance, making it easy to prepare for the test, and easy to pass it. There are two higher levels of Ham license you can also obtain, after passing two more exams. We have a separate article that tells you all you need to know about how to become a licensed Ham radio operator. The FCC forbids the use of encryption or scrambling (two words that essentially mean the same thing) or talking in code on these public access frequencies. But it does allow people to use codes such as the popular ’10 Code’, and as you’ll see if you do some research on the 10 codes, there are an enormous number of different codes, and some numbers mean different things in different areas for different user groups. Yes, 10-4 pretty much universally means ‘Okay, understood, agreed’ but beyond that, things get more arcane and individualized. There are some walkie-talkies with built-in encryption capabilities. You can legally buy these, but you can’t legally enable the encryption feature. That might sound stupid, but – hey – you can legally buy a sports car that will do 200 mph even if you’re not allowed to drive it at that speed anywhere. If you want to draw attention to yourself, then start using encryption. That’s a sure way to end up with an unwelcome visit from an FCC Radio Inspector (there are legions of self-appointed ‘spies’ – Hams who monitor radio communications eagerly looking for violators they can report to the FCC for enforcement action). But if you want a low level of security you could use your own set of 10 codes, and you could also use some obfuscations – for example, maybe you could flip any bearings you give and say a number 180 degrees different, and maybe you could change numbers in some way too. ‘I see ten people six miles south of us’ might mean ‘I see five people three miles north of us’. Some type of wireless communication service and strategy will be close to essential for life after TEOTWAWKI. Ham radio gear is probably the best choice for the truly dedicated prepper, but if you have less time, less budget, and less technical skill, then GMRS radios are probably the second best choice. Please see our detailed two-part Buyer’s Guide to Walkie Talkies for information on how to choose the most appropriate units for your needs and budget. 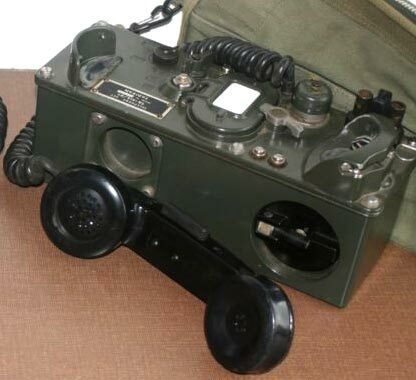 A classic US military TA-312A/PT Field Phone. As we’ve discussed in our article ‘Will there be telephone service after TSHTF?‘, it is probable that any event such as to activate your prepping survival plans will see a loss of both wired and wireless phone service. We also predict the same failure for internet service, for similar reasons. This will make your retreat electronically cut off from the outside world. Oh – with the likely shortage or total disappearance of diesel and petrol supplies, you’ll become more physically removed from the nearest township too. There will remain methods of communication, which we’ll discuss in subsequent articles in this series (particularly ham radio, and we’ve already advocated you should get a ham radio operator license) and of course other methods of transportation (or of fueling your current vehicles) too. But this article approaches one of the alternatives you have for communications in, on and around your retreat property. Using Wired Phones. Apart from smoke signals, semaphore, and other ‘low bit rate’ forms of signaling, most of your communications around your retreat property would be either by wireless telephony of some sort (CB or other walkie-talkie, ham radios, Wi-Fi devices or cell phones) or by wired phones. As we never tire of saying, you need to plan for a low-tech ultra-reliable type of communications that you can be certain will survive any initiating events that plunge you into a Level 2/3 situation, and which will continue to operate during the period of that situation. As lovely as wireless devices are, they are less resilient. There is another downside to wireless communications. They are more readily detected and monitored by unfriendly people. What is the point of being obsessive about ‘Op-Sec’ in a dozen different ways if you are chattering away on walkie-talkies regularly every day, providing a huge big electronic ‘homing beacon’ for unfriendly people to zero in on. With scanning radios nowadays being inexpensive, readily available, and easy to use (for example, the $100 Bearcat handheld scanner listed on the many pages of scanners at Amazon, here ) you have to assume that any radio transmissions you are emitting will eventually be picked up by people who may not have your best interests at heart. Wireless devices also need batteries. Sooner or later, you are going to run out of batteries, and/or your rechargeable batteries will wear out. In comparison, wired phones are much more secure and harder for unwanted third parties to eavesdrop and listen in on. They are generally lower tech and probably are more likely to be repairable if they develop a problem. They might also require power, but they are probably much more forgiving about the type of power and the exact voltage they’ll operate with than is the case with a wireless device. But a wired phone is not something you can have with you, all the time, everywhere you are located. You need to have wiring run to each place a phone is placed. And the wires are somewhat vulnerable to accidental or deliberate damage, although it is true your radio signals could also be deliberately jammed (all an enemy would have to do is to transmit on the same frequency as you any time you started a transmission, which might cause your transmission to be displaced by his). Overall, if you are asking yourself the question ‘Should I prepare for wired or wireless communications at my retreat?’ you are probably not asking the correct question. Ideally, you should have both. Where possible, you’d use wired communications, but also have the ‘safety blanket’ of a wireless device with you for emergency communications. Note that emergency communications might occur from you to other members of your retreat community, or equally likely, in the other direction from them to you. Emergency communications don’t only involve ‘Help, we are being attacked’ type scenarios. There are plenty of other emergencies and high priority reasons for calling someone else, and many of those scenarios won’t see either you or the person needing to contact you being at a wired phone. So in the balance of this article, we look at issues to do with a simple type of wired phone – the field phone. We’ll also be publishing articles on other communication options subsequently. What is a Field Phone? There is no formal definition for what a field phone is or is not, other than a vague expectation that it is a rugged device and probably of military origin. When we talk about field phones, we are referring to very simple basic analog phones, although note that the latest military field phones are sophisticated digital devices. There is nothing wrong with these at all, but they require more support and high-tech infrastructure than very low tech analog devices and from a prepping perspective, we are best advised to keep it as simple as possible. The simplest phones of all require no power of any sort – no mains power, and no battery power either, because they are sound powered. 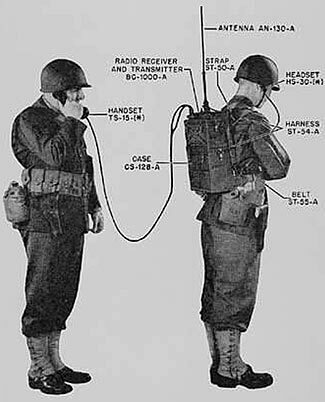 Slightly more sophisticated field phones are battery-powered, either from batteries inside each phone set or by batteries at a central switching location. Field phones are connected to each other and to switching points via ordinary wire (rather than coax cable). Some phones use two wires, others use four wires. Two wire phones are typically a ‘simplex’ type of operation where only one person can be speaking at a time (like using walkie-talkies); four wire phones permit ‘duplex’ operation with both people speaking simultaneously. Field phones are generally not equipped with dial pads and generally are not connected to any type of automatic switching exchange. They certainly could be equipped with such capabilities, and be connected through an automatic exchange too, but as the sophistication of the phones and the required ‘central office’ support equipment increases, we feel we are no longer talking about ‘field phones’ which, by definition, should be thought of as very simple devices with limited capabilities. There is no reason why you couldn’t create your own automated private exchange if you wish to do this – there are plenty of ‘off the shelf’ systems that you can buy for varying amounts of money, and with varying features, and you might validly wish to add a small private exchange to your retreat as well. But the more sophisticated you make your communications, the greater the vulnerability they present. They become more maintenance intensive, they become more energy intensive (requiring good quality electricity) and they become more EMP-vulnerable (phone lines will act as antennas to funnel and magnify EMP energy into the phones and other devices they are connected to, making phones and phone switching equipment very vulnerable to EMP effects). There is also no reason why some field phones could not be connected – either directly or through your own branch exchange/switch, to the public phone network as well. But you’re running into the danger of ‘over-engineering’ your situation and your solution. Field phones are designed to be simple in form and simple in function. At the other extreme to the latest multi-feature digital phone, you end up with a sound-powered phone. Sure, it does nothing other than transmit voice to another person, but there’s almost nothing that can go wrong with it, and the few things that might go wrong can generally be repaired without any specialty high-tech tools, equipment, or parts. Some things are common for all field phones – especially issues to do with how you wire them. We consider these issues in this article; in another article we talk about the different types of field phones you can choose between. Unlike wire for data or radio frequency circuits, field phone wire doesn’t need to be shielded, and doesn’t require any other special properties. It just needs to be insulated and suitably strong for however you’ll be laying it. Field phones can operate on pretty much any type of electrical wire at all. The larger the gauge of the wire, the less the resistance and the longer the distance you can have between phone sets, especially with sound-powered rather than battery-powered phones. The ‘entry level’ least expensive and arguably most common type of wire for military field phones is the WD-1/TT or WD-1A/TT single pair multi-strand wire. It is lightweight and inexpensive, and you can sometimes find it for sale on quarter mile or longer reels. There are also plenty of other types of mil-spec wire (with better conductivity, but greater weight and higher cost) and there’s no real need for the wire to be mil-spec anyway. If money allows, whenever you run one wire, run two or three, because you’ve no idea what you might not want to have in the future, and it is very much easier to run multiple wires at the same time than it is to redo the whole exercise and run more wires later. In the case of phone wiring, this means that even if you’re only planning on using a single wire pair type phone system, you should still make a point of running two pairs or four pairs of wire everywhere. Who only knows what you might not end up using the additional pairs of wires for – you might upgrade your system to a four wire phone system, you might use the wires to run some power, or for remote metering, or who only knows what else. Or maybe one of the wires breaks and you can then switch over to another spare wire. Of course, it is one thing to be running multiple pairs of wire over short 100 ft distances within your retreat. The extra cost is minimal. But if you’re running a one mile line from one end of your property to the other, or a five mile connection to your neighbor’s retreat, then the cost of doubling up on your materials becomes more appreciable and you might have to compromise between what would be ideal and what is feasible. The length of wire you can run is limited primarily by the resistance of the wire. Resistance is determined by the type of material, the thickness of the wire, and the length of the wire. In general, copper is the best conductor of electricity (ie it has the lowest resistance), with aluminum as second best, then iron, then steel. If copper has one unit of resistance, then aluminum has about 1.6, iron has about 6, and steel has about 8.5 units. To put that another way, for every 8.5 ft of copper wire, you can only have one ft of equivalent thickness steel wire; or for every 1.6 ft of copper wire, you can have one ft of aluminum, and so on. Another way of looking at it is that to have the same resistance, you must have a steel wire nine times thicker than a copper wire, because the larger the thickness or diameter of the wire, the better the conductivity. On the other hand, the thicker the wire, the heavier it is, which poses problems if stringing it up between poles, and adds to its cost, no matter how you are running the wire. Several different sources list comparable effective distances for TA-312 phones depending on the type of wire they are being connected together with. The same concepts apply to other phones too, of course, such that if a phone’s range with one type of wire is twice as long (or twice as short) then it would be similarly twice as long/short for the other wire options presented as well. Here’s the table for TA-312 phones (source – alas, the company that lists the phones no longer makes/sells them – I checked in March 2013). As you can see, the practical working distance lengthens dramatically as the wire thickness increases. Wiring for inside your retreat is a relatively trivial issue. You’ll probably have it in the walls and ceiling and terminating in wall jacks, just like for regular phone and data wiring. But how you run your wire outside is a more complex consideration. The first consideration is security. If you don’t want your wire to be obviously exposed, then you’ll almost certainly have to bury the wire to obscure and protect it. An exposed wire poses several security threats. First, it could be damaged/broken. Second, it could be followed, perhaps helping an unfriendly visitor to locate any remote observation posts you might have. Third, it could be tapped into, allowing unknown parties to listen in on your conversations. And fourthly, a person might connect a high voltage device in series or parallel with the line, probably destroying whatever devices were connected at either end. So, for security purposes. a buried line is better than an above-ground line. Buried lines can be both more vulnerable and less vulnerable to accidental damage. There is a risk of someone digging through the line, or perhaps as part of plowing a field also damaging the line. Gophers and moles can be a problem, too. Over time, tree roots may damage lines. If a buried line is damaged, it can be more difficult to locate and repair the damage that with an above-ground line, unless you have a sophisticated test device that will tell you the approximate distance to where the line damage is located. If you are running below-ground wire, you don’t need it in conduit, although that would enhance its protection appreciably, and so if budget allows, we would recommend you to do so, and particularly if you anticipate potential mole/gopher type challenges. We suggest that one way to protect below ground wire – and to conveniently locate it again if you need to – is to run it alongside fence lines. Usually any plowing or other working of the ground doesn’t go hard up to the fence line, so your wire is more likely to be undisturbed. On the other hand, above ground lines are far from bullet-proof, either. Indeed, there’s a vulnerability in that expression – there’s a danger of idiots capriciously or maliciously shooting at your lines just for the fun of it. Depending on how you are keeping the lines above ground, if they are strung from tree to tree, you have obvious problems in the wind. The only good thing about above ground wires is that it is easy to trouble shoot them and to repair them if (when) they break. Generally we recommend below ground wiring. If you have below ground wiring, we’d suggest that, where appropriate and possible, you either have inspection and access traps to allow you to easily access the wire or simply run the wire up above the ground on a post then back down below ground again. If you run the wire in direct lines between traps or posts, that will help you follow its path if you need to dig it up to repair it in the future. The traps or posts also provide access points where you can connect phones. If you have a wire fence, why not use the fencing wire to carry a phone signal, too? That is certainly an option. Typical fencing wire is made out of zinc coated steel, and is 12 – 12½ gauge in diameter. A 500 ft length of 12 gauge copper wire has a resistance of 0.77 Ω, a similar length of steel wire has a resistance of about 6.6 Ω (source). Or, to express it another way, the resistance you’d encounter with 100 ft of WD-1/TT wire would be about the same as you’d encounter with 140 ft of fencing wire. Using fencing wire for your field phones also has the advantage that you can tap into the circuit any time you are close to the fence line. It is semi-secure, being ‘hidden in plain sight’. If you were going to do this, then assuming you have a more than two wire fence, we’d recommend connecting the top wire and the third wire together for one part of the phone two wire pair, and the second and fourth wires together for the second phone wire. Every so often, you should run wires connecting the electrically twinned/joined together fence wires. This makes the double wiring more fault tolerant. Doubling the wires this way not only halves the resistance (so then 280 ft of doubled fence wire would be the same as 100 ft of WD-1 wire), but also gives you some redundancy – one of the two wires can break and the other one still remains in place. And by using only the top wires, the bottom wire (in a typical five wire fence) is left untouched, with this being the one most likely to be contacted by grass and other vegetation that might otherwise cause some of the current to ‘leak’ out. If you only had three usable strands of wire, we’d recommend that about half the time, the third wire be linked to one of the two wires and the other half the time, it be linked to the other of the two ‘main’ wires. That way it gives you a reasonably balanced/averaged resistance on both sides of the two wire line. We would recommend using the middle wire as the one which alternates between sharing the signal with the wire above it and the wire below it. That way, if you wanted to connect a field phone up to the fence wires, you always know to use the top and bottom wires and to ignore the middle wire. It doesn’t matter if it is sharing the top or bottom wire, wherever you are. Clearly, if you came to a gate, you’d then need to have ‘normal’ wire running down from the fence posts, under the entrance/gateway, then up the other side again. And anywhere you had joins in the wire, you’d want to make sure the two lengths of wire had plenty of contact between them to create a good electrical connection. In general, it would be preferable to run your fencing with as few joins as possible. There are several considerations and different ways to run your wiring. In its simplest form, you have a simple single pair line running all around the place, and you can connect phones on and off this single pair line anywhere you want to, any time you want to. Simple sound powered phones will get quieter and quieter for each extra phone currently connected (in parallel) across the wires, so that is a limitation, and there is a similar (but not so severe) type of limitation for battery-powered phones too, but for a quick and easy initial wiring layout, this works just fine. If you have multiple phones on the one circuit, then anyone can pick up their phone and hear what other people are saying, and there has to be some sort of signaling protocol so a person calling another person can make the call request in a manner that doesn’t cause everyone to simultaneously rush to pick up their phone, only to find that the call wasn’t for them. There is a variation on the single length of circuit concept, which is to make it into a loop. This makes the circuit fault tolerant – you can have a break in the loop occur somewhere and the circuit will still work because the current simply flows the ‘other’ way between the devices. This also makes a nice way of managing your circuit – you can have a test point on each of the two wires that is a break in each wire. Normally you have the breaks joined together, but you can open up the test point and check for continuity/resistance in the circuit. You’d get a very different value if a break in the line had occurred than if the line was still okay in both directions – although note that this value will vary depending on how many phones are also connected in parallel across the line and where they are located. Best to do the test with as few phones across the line as possible. A more sophisticated system has a star type of shape. A central point – somewhere in your retreat building, probably, has multiple lines feeding out to different locations, with phones being connected on these multiple lines. When someone calls on the remote phone, it rings at a switchboard in your retreat, and when someone answers, they can then either talk to the caller or connect them to one of the other phones if the caller wished to be switched to another person on another circuit. The benefit of this type of system is that you can have multiple conversations simultaneously, and happening separate to each other, rather than having everyone simultaneously using the one circuit and struggling to get a word in edgewise. In reality, you’re probably not going to have – or need – an extensive phone network. You might have one phone in the barn, a ‘traveling’ phone that people can take with them when they are working in the fields, maybe another phone as a ‘gate phone’ that visitors can use to call to you at the retreat from your property boundary/gate and ask for permission to enter, and maybe another phone in an observation post. Good and convenient communications simultaneously become more essential and more difficult in a future ‘grid down’ situation. They are more essential because you need to live your life more efficiently, and good communications is an essential part of coordinating your life and your activities with those of the other people in your community. Good communications are also an essential part of your retreat’s security program. But the ‘grid down’ nature of a future Level 2 or 3 situation means you have to provide your own solution to your communication needs. We recommend you adopt both wired and wireless communication services, and in this article we have given you some of the information you need to install a wired field phone type system. Is Your Money Really Safe In The Bank? 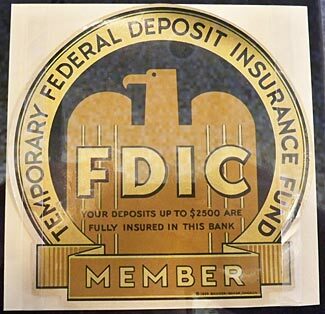 The original and ‘temporary’ FDIC logo’ from 1934. In the US, one of the bedrock values of our society and our commercial system is the safety of our money when we deposit it in a bank. Every time we walk into a bank, we see the FDIC promise – often on the very doors we walk through – reassuring us that the first $250,000 of our money in each different type of qualifying account at each different participating bank is ‘backed by the full faith and credit of the United States Government’. Clearly this guarantee counts for something. Since the start of the FDIC program on 1 Feb 1934, and not withstanding a dismayingly large number of bank failures over the years, no depositor has lost a single penny in an insured account as a result of a bank default. The government doesn’t just do this out of the kindness of their heart – although, to be accurate, the cost of operating the FDIC program is paid for out of compulsory bank levies rather than by the federal government. The government enacted the legislation and continues the FDIC program because there are sound public policy reasons for allowing people to feel confident in their bank deposits, and sound economic reasons for encouraging people to save money in a bank rather than under a bed. Indeed, a cynic would point out that one of those reasons is that money in a bank is public, visible, accountable money which the IRS can focus on. Maybe you’ve heard about occasional problems in other countries at other times. But they’ve either been many decades ago, or else countries not like the US – countries with dysfunctional economies and capricious governments that clearly don’t respect private ownership of property and money. Such situations and actions seem impossibly removed from our stable environment in the US, and few people here see them as posing any meaningful warning lesson. Indeed, we almost never really stop and think about the underlying reality of how safe our money actually is, because – and happily – it is unthinkable that our money is anything other than 100% safe. Right? Wrong. As you may have read, on Saturday 16 March the EU forced the Cyprus government to agree to the terms of a €10 billion (US$13 billion) ‘bail out’ of their economy, which would require the Cyprus government to take a slice of every person’s bank account balances as their contribution to the bailout. Cyprus is both a member of the EU and of the Eurozone (ie it uses the Euro currency) and its financial problems impact on the Eurozone as a whole, with other Eurozone members increasingly asserting what would formerly have been sovereign powers held by the individual member nations. Although it makes economic sense to have matched monetary policies if you also have a shared common currency, it was not countenanced as part of the EU and Euro agreements, and the citizens of countries such as Cyprus, Greece, and other countries needing economic help are now finding their national governments are being dictated to by other EU powers (most notably Germany, causing some countries to wryly note that Germany’s failed power grab during WW2 is now being replaced by a more successful economic rather than military power grab). So, anyone with a bank account in Cyprus, whether a Cypriot national or not, is now liable to have 6.75% of their funds under €100,000 taken from them, plus a larger 9.9% slice of all deposited amounts greater than that. The unfairness of this is breathtaking. Bank balances are totally unrelated to wealth. Many super wealthy people have no money in the bank at all – maybe indeed they only have overdrafts (question to the EU – if you take money from people with deposits, will you give money back to people with overdrafts? ), but they probably also own much property, stocks and bonds, and other assets galore. On the other hand, a small businessman’s bank balance might be money that is not his – it is money that he has received from selling goods which he will have to subsequently remit to his suppliers. But, at the behest of the EU, Cyprus is now poised to take up to 10% of every bank balance in the nation, without any adjustment for what the type of funds may be, and equally from retirees living off their savings as from young mega-millionaires, equally from non-citizens as from citizens. Of course, as soon as word leaked out about this, there was a run on the banks and ATMS. So the ATMs were switched off, and the banks, which were closed over the weekend anyway, have also been closed today (Monday) and will remain closed tomorrow (while the government passes the law to enable the compulsory taking) and on Wednesday also. The even unkinder thing is that the EU has a similar deposit guarantee program to the FDIC program in the US, guaranteeing the safety of a person’s first €100,000 in their account. That guarantee will be over-ridden and ignored. Apparently the one thing the EU guarantee won’t guarantee is its own illegal actions. Although the EU says they’ll never ever do this again, it being a unique ‘one off’ event, the reality is that they’d have to say that, wouldn’t they. If people believed they might lose 10% of their bank balances at any time with no warning, who would keep any money in a bank any more? Especially with banks paying almost no interest, there’d be a resurgence of people hiding cash under the mattress, and a growth of a cash economy which would reduce tax collection rates as well. So the official word is that for who knows what reason, the EU decided to do this once and once only, in the tiny island nation of Cyprus, but never again, and nowhere else. And if you believe that, I’ve some ocean-front property in Arizona, and a bridge in Brooklyn that you might like to buy. Whether the EU might do this again or not is anyone’s guess. But the key thing is they are doing it now. They have vividly broadcast to the world as a whole that even a seemingly ‘secure’ and ‘stable’ and totally bound-by-the-rule-of-law federation of nations such as the EU is willing to engage in an unlawful taking of money from its citizens, on the most unfair and inequitable of methods, and with no prior debate or decision-making process. The sanctity of private ownership has been cast aside. Such an act would have been unthinkable on Friday. If you’d told your friends that on Saturday the EU would unilaterally decide to force Cyprus to steal 10% of its citizens’ bank account funds, you’d have been laughed at like you were a crazy fool. (a) A disruption in the banking system from Saturday through at least Wednesday – how would that work for you if for five days, maybe longer, all the banks were shut and you couldn’t get a single penny in cash? (b) Government guarantees about the safety of your deposits being ripped up and ignored. (c) An arbitrary capricious and colossally unfair taking of up to 10% of all the funds in your accounts, whether the money is yours or not, and no matter what your overall financial net worth or wealth may be. Oh – and this money is taken with no notice or warning. And now for the really big question. What happens in Argentina is of admittedly little relevance to what we can expect to happen here in the US. But if Germany and the other EU giants force Cyprus to do this, they’ve made it into a bona fide government tool for emergency revenue collection. What would stop our own government from doing the same thing? Some Wild and Crazy Conspiracy Theories? Lastly, just to think out loud – bank and economic crises and unpopular government actions such as those in Argentina, those in Greece over the last few years, and now in Cyprus currently, have been greeted by mass civil unrest and rioting. If the same thing occurred in the US, it is reasonable to assume that a similar violent response would result. Now I’m not saying that you and I would react violently, and hopefully we wouldn’t. But there’s an entire ‘underclass’ of people in this society that happily goes violent at any opportunity for any reason, and you just know for sure that they’d gleefully seize on the opportunity, sweeping up naive ignorant other groups of people with them (the ‘Occupy Wall St’ types, the anti-global trade types, and so on). We’d definitely have our fair share of civil commotion. Now think for a minute – why exactly is the new Department of Homeland Security – an enormous government department that didn’t even exist until some ten years ago – buying up billions of rounds of ammunition at such a rapid rate that we normal citizens can’t find any ammo on the shelves when we go to buy some for ourselves? Why is the DHS also buying up more fully auto battle rifles, and why is it buying 2,700 armored vehicles – light tanks? This isn’t the army, buying up equipment for foreign wars. This is the Department of Homeland Security, that only operates within our borders. It isn’t to protect us against a foreign invader – that again would be the army and the national guards. It shouldn’t even be against normal criminal threats and activities – that’s what we have city, county and state police forces for, plus a bevy of federal agencies too. The only ‘enemy’ the DHS has is us – the ordinary normal US public. How are they going to use the 2,700 light tanks against us, and why do they think they will need to? We don’t have answers to these questions. But we do think the questions are valid and need to be considered. The bond of trust that we have in our banking system has to be seriously questioned based on what is going on in Europe. By all means keep some money in the bank, but spread your funds around, both in banks and also in smaller credit unions too, and keep a reasonable amount of cash and other ‘liquid assets’ on hand so that if your bank accounts are frozen, or if banks undergo an extended closure, you can still buy the things you need. Note that we refer to cash and also to other liquid assets. Something else we’ve seen happen in other countries is a country demonetizing its entire stock of banknotes and replacing them with new banknotes. Sometimes it is part of a revaluation of the currency (eg in Russia on 1 January 1998 with each new rouble being worth 1,000 old roubles), and other times, it just happens ‘because it can’. We’re halfway to that point already – with the claims (that may well be without any truth behind them) of our currency being victimized by foreign counterfeiters, and we’re on the way to the other half by claims about the problems with money laundering being used to fund international terrorists and drug dealers. So it is easy to see how one day the government could surprise us all and say ‘Okay, all old money is no longer valid legal tender, and you have 30 days to convert your old money to this new type of money, and on the 31st day any remaining old banknotes will be valueless’. You just know that if you then turn up at an official exchange point with an unusually large amount of cash, questions will be asked about where you got all that money from. We point out in our several articles about the economic system after TEOTWAWKI that we don’t think that either regular US currency or gold and other precious metals will be of any value at all. But prior to that point, we do agree that gold and other precious metals are a good way to store your cash, safely away from the uncertainties of the banking system. Update 1, March 19 : The headline on this article says that New Zealand is also considering a ‘Cyprus Style’ theft of bank depositors’ funds, but if you read the article, you’ll see that actually what the country is planning is a ‘self insurance’ scheme whereby if a bank fails, all depositors of that bank are affected equally, rather than the more common type of bank insurance scheme such as FDIC. Nonetheless, while not an arbitrary government confiscation, it does show that the concept of the absolute safety and sanctity of bank deposits is being challenged not only in Cyprus, but on the opposite of the world too. Update 2, March 19 : It is Tuesday evening in Cyprus and the country’s legislators are still hesitating to vote on the proposed legislation. It seems the proposal has been varied to now exempt people with balances of under €20,000 from the levy, but exact details are not currently known. Update 3, March 19 : Cyprus’ parliament met and astonishingly roundly rejected the EU dictat. 36 members voted against, 19 abstained, and one member was absent. None of the members supported the bill. But what will happen next? The EU support was conditioned on the bank funds seizure. This ain’t over, but the first battle has at least been won. Meantime, public confidence in the Cyprus banking system has been done more harm (by the initial acceptance of the proposal by the Cypriot President and his advisers) than good (by the rejection of the measure by parliament). Update 4, March 20 : At the end of Wednesday, 24 hours after the Cyprus parliament voted against the levy on bank deposits, no alternate way of raising the €5.8 billion that Cyprus needs to raise in order to qualify for the €10 billion from the EU has been agreed upon. There is some thought that Russian interests might end up buying Cypriot assets at fire-sale prices, but currently, banks remain closed, and some politicians are speculating that they might never re-open. The UK is air-freighting in cash for its citizens, the rest of the country is being forced to make do any way they can. Update 5, March 21 : Cypriot ATMs are now disbursing small amounts of cash to bank account holders, but the banks remain closed for normal business, and are not now expected to open until Tuesday next week. Meantime, there is growing political support for a new attack on the country’s citizens – the government is now considering nationalizing major pension funds. This would give them access to the cash stored in these funds, meaning that the funds would now have to promise to make future pension payments to their members based not on their liquidity and assets, but rather on government promises. If that sounds familiar, it should be. That’s a sad but accurate description of how social security currently works in this country. Update 6, March 23 : It is now Saturday again, a week since the first proposal to steal a slice of everyone’s bank accounts in Cyprus. After being overwhelmingly rejected by their Parliament on Tuesday, guess what? The proposal is back again, except this time, it might be an even larger 25% levy, but only on deposits over €100,000. Cyprus has until Monday to meet an EU deadline for somehow devising a plan to raise the €5.8 billion share of its bailout the EU is requiring. Update 7, March 25 : A new agreement has now been reached with the EU, barely avoiding the Monday deadline imposed by the EU. Avoiding a nasty legal fight over the EU’s obligation to guarantee deposits under €100,000, the new agreement only attacks deposits larger than that amount. According to the linked news item, it seems that in Cyprus’ largest bank (Bank of Cyprus), those depositors may lose up to 40% of their deposits, whereas in Cyprus’ second largest bank (Cyprus Popular Bank), those depositors may lose everything. It seems this new agreement does not need ratification by the Cypriot parliament, and in any event, it would likely be ratified if it came to a vote. The reason this is more popular – most of the owners of accounts with large sums in them are not Cyprus voters but rather foreign nationals – typically Russians. So with brilliant political acumen, Cyprus has fine tuned its approach to inflict least harm on voters and most harm on non-voters. Nonetheless, the genie is now out of the bottle. In Europe, at least, politicians have displayed a willingness to countenance seizing bank funds without any type of underlying equity or fairness, and to ignore the bank deposit guarantees when doing so. Update 8, March 26 : Banks remain closed and account holders are being limited to €100 ($130) a day in cash withdrawals through ATMs. Meanwhile the EU, delighted at its ‘success’ in Cyprus, is now threatening similar seizures of bank savings in other countries, too – please see our new article ‘We Got Away With It in Cyprus, So We’ll Do It Again‘. Update 9, March 28 : Today – Thursday – the banks in Cyprus hesitantly opened, and we’re guessing they’ll be closed again tomorrow for the Easter weekend. Citizens can now withdraw up to €300 at a time, although the country’s stock exchange remains closed, and there is a ban on taking money out of the country – a ban that is almost certainly contrary to EU and Eurozone rules. Meanwhile, Russia has announced plans to force its citizens to put their money into banks – or, at least, much more of it than at present – by introducing a ban on cash payments over $10,000. This is not as easy as it might seem, because credit cards are rare to non-existent, checks are similarly unknown in Russia, and bank wire transfers cost up to 4% of the amount being transferred. The Russian government says, unsurprisingly, that it is doing this to crack down on the ‘shadow economy’ – details here. Note that in our own experience in Russia, both living there and working there, the shadow economy is considerably greater than officially estimated, although when Russia switched from a typical tax system with escalating rates of tax as your earnings increased to a simple flat tax of only 13% in 2001, this caused a surge in taxes paid – an increase of tax collections by 25% in the first year alone. Unless something substantial occurs, we will end our ongoing updating of this article today. Will There be Telephone Service After TSHTF? Phones have been an inseparable part of our lives for almost 100 years. It is hard to imagine a future without them. Have you thought about how you’ll keep in touch with the other members of your retreat community in a Level 2 or 3 situation? When things go bad, two of the first things to fail will be cell phones and landline phones. How will you all keep in touch without these modern conveniences? The good news is you have lots of different ways to achieve ongoing communications capabilities. That’s also the bad news, too, because a multitude of choices makes for more difficult decisions than a single obvious right choice. Which are your best strategies to adopt? In this, part of an ongoing series on communication methods and strategies, we explain why your wired and wireless phones will fail. Although we’ve come to take for granted a near 100% uptime with our phone service, the excellent reliability we have enjoyed in the past will in no way guarantee a similar uptime in the future. 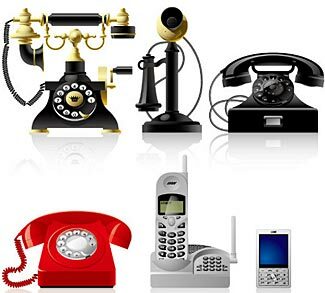 The problem with all phone service – whether wired phone lines, sometimes also referred to as landline(s) or POTS (Plain Old Telephone Service), or wireless – is that there is a lot of infrastructure providing connections between you and the person you are calling. All of this infrastructure is complex and – most significantly – all of it requires electricity to operate. Depending on the nature of the problem that creates the Level 2 or 3 situation you are now responding to, some of the above-the-ground and even possibly some of the in-the-ground infrastructure supporting both wired and wireless phone service may be damaged. Bad weather or explosions may cause phone lines to come down, and similar events may also cause cell phone towers to be downed. As for in-the-ground services, while a bit of wind or even water or fire is probably not a problem, what about an earthquake? If the ground shifts three or six feet, will the wires and fiber stretch or break? More likely the latter. While telephone exchanges and even individual cell phone towers often have battery and/or generator backup to provide emergency power, sooner or later (and usually sooner) the battery backup will be exhausted, and the generator fuel all used up. Most of the serious and substantial disasters we are considering will mean there is no easy way of replenishing the fuel tanks once their stored fuel is exhausted. No power means no service. In addition to the main ‘central office’ or ‘exchange’ switching points that you might be vaguely aware of, most phone service these days uses fiber optic lines and/or microwave links, adding extra steps in the chain with the need for electrically powered amplifiers and repeaters along the way from you to the other person. Even a call from your home to your next door neighbor probably gets routed through half a dozen different switches and amplifiers and other electronic intermediary points – a loss of power at any one of those intermediary points will kill the connection. Maybe some level of service can be restored or maintained. But what happens when a component fails? Most ‘repair’ work these days is not actually repairing as the term used to mean. Instead, it is ‘repair by replacement’ – a bit like how the ‘tube jockeys’ of 50+ years ago would repair a radio or television just by unplugging and replacing tubes until the device started working again. These people didn’t need to understand how the radio or television worked, they just needed to understand how to swap out tubes, one by one, until the problem disappeared. These days many/most technicians only know how to replace complete circuit boards and assemblies. If something fails, they can’t now identify the specific failed component on a circuit board and replace that – they replace they entire circuit board, and probably then send the failed board to a central repair facility somewhere else – possibly even in another country – where either a person or a machine may identify the failed component and, depending on what it is, might attempt to replace it. Indeed, with integrated circuits and surface mounted devices, the earlier notion of a circuit board with 50 or 100 separate electronic components with leads out of each soldered into holes in the circuit board no longer applies. This makes it easy to repair equipment when replacement sub-assemblies are readily available, but when they cease to be available, the failure of one individual component causes the entire circuit board or assembly to stop working. In a serious disaster, once whatever inventory of spares is used up, there won’t be any more being made. So even if power is able to continue to be obtained, the network will slowly degrade with equipment failures. Here’s another thought to keep in mind. Let’s put a ‘best case’ overlay on a ‘bad case’ scenario. In other words, some sort of event occurs that impacts on society’s ability to continue normal phone service. That’s the bad case we start with. But let’s be positive – after some scrambling around and redirecting of resources and everything else, engineers have managed to restore service to a third, or maybe even a half of the total phone system and service network. But what does that actually mean for you as a user of the service? Does it mean half the time you get a dialtone, and half the time your call can be completed? Does it mean call quality is diminished, but still reasonably acceptable? Does it mean half your friends have working phones and the other half don’t? We suggest it means that nothing will work. Remember what we said above – to complete any type of phone call, your voice gets electronically routed over multiple stages. Let’s say your call goes through six segments. If one of those segments fails, that doesn’t mean that 5/6 of your call still proceeds, does it. It means your call will completely fail. This assumes the network is not self-repairing and not able to intelligently re-route; probably some stages will be able to re-route, but others will not, and it just takes one non-reroutable stage to fail for everything to fail. In other words, a chain is only as strong as its weakest link. A single missing link and the entire chain becomes useless. All the preceding assumes some type of initial event that causes the Level 2/3 situation other than an EMP attack. If the initiating event is an EMP, then we don’t have a relatively benign gradual degradation of service, we have close to an immediate and complete, total failure. And with massive damage to most circuitry, it won’t be possible to jury rig some partial solutions to provide some limited comms capabilities to some parts of the community. It will all be down and dead for an extended time – definitely months and possibly years. There are several stages to our response to any disaster. The first stage involves getting ourselves and other family members to an initial staging area; the second stage involves moving to a safe retreat. The third stage involves hunkering down at the retreat and surviving the situation as best you can. Check your plans for how you’ll manage each of these three stages. Does any part of these three stages assume that you can use regular landlines or wireless/cellular phones? If it does, you need to come up with an alternative communication strategy to recognize that there’s every good chance that the phone service you need will not be available when and where you need it.